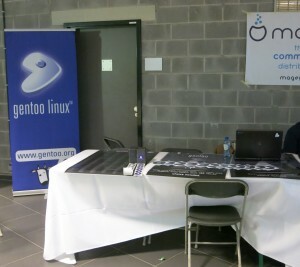 Gentoo Linux was present at this year's Free and Open Source Developer European Meeting (FOSDEM). For those not familiar with FOSDEM it is a conference that consists of more than 5,000 developers and more than 600 presentations over a two-day span at the premises of the Université libre de Bruxelles. The presentations are both streamed directly and recorded making it available to browse the archive once published. Hanno Böck, a name mostly heard in relation to the fuzzing project, was the only Gentoo Developer presenting a talk this year on the very important subject of security and how Gentoo can be used as a framework for running Address Sanitizer to detect security bugs: "Can we run C code and be safe? : A Linux system protected with Address Sanitizer". 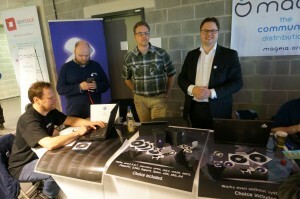 For the first time in many years Gentoo had a stand this year where we handed out buttons and stickers in addition to a LiveDVD. 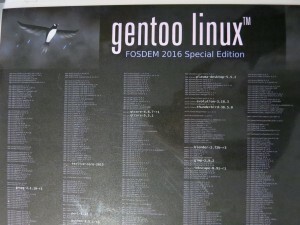 The Gentoo Ten team created a hybrid amd64/x86 "FOSDEM 2016 Special Edition" release for our user's benefit (thanks likewhoa! ), and 200 DVDs were printed of which 155 were already distributed to potential users by the end of day one. A posters on the stand succinctly listed all the packages included on the LiveDVD with some highlights of packages more familiar to some users, something that also highlights one of the benefits of rolling release distributions in that the versions are up to date with upstream releases. If the LiveDVD is used on USB instead of the handed out DVDs it also offers the option of using persistence to store changes on the USB. It uses aufs to layer a read-write file system on top of a read-only squashfs compressed file system. This is great, because it allows you to make changes to the livedvd and have those changes appear on future reboots. As mentioned in a blog post by dilfridge the stand also attracted attention due to a comment involving Gentoo Linux by Lennart Poettering in his keynote speech as a distribution that doesn't use systemd by default. 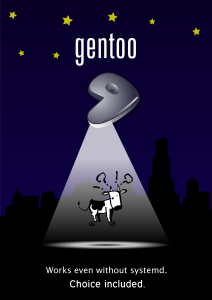 This fit nicely with one of our banners at the stand; "Gentoo Linux | Works even without systemd | choice included". There was a lot of positive feedback from various users and the stand functioned very nicely as a meeting place for the various people and the atmosphere was good throughout the conference. As has become a tradition there was also a Gentoo dinner again this year amongst developers and users (thanks xaviermiller), a nice way to meet up and discuss everything in a relaxing setting. Updated 2014-12-23: Update file links to gitweb. I recently got myself a new server that is, amongst others, intended to use for kvm/qemu virtual machines that I administer using virt-manager. As most of the guest VMs will be running Gentoo linux, and the installation procedure is nice and command-line based it enable quick installation of an up to date system without using an image by utilizing a few simple bash scripts that require a minimum of user interaction during install in order to get a base OS. It goes like this: After booting the Gentoo live-cd we reset the root password to get a known password and start sshd to allow me to upload the script files. A little trick on getting to use the LVM drive directly in virt-manager is to create a storage group for the directory of the volume group (/dev/vg0) which allows me to allocate the logical volumes directly to the drive as a virtio disk. and we have a working base-install of a VM once it gets back up. Then I can start making any adjustments for the service the VM is supposed to provide from here.